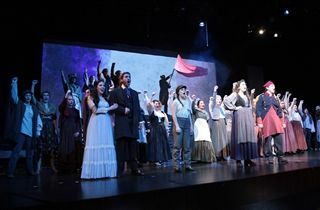 Congratulations to the cast and crew of Les Misérables on spectacular production last weekend. This was a tremendously ambitious show, and both cast and crew delivered a polished and moving set of performances. Congratulations to director Kate Scinta, musical director Karen Welsh, and technical director Rudy Keel on a terrific show. Finally, thanks to the Fine Arts Guild, whose contributions allowed this production to be accompanied by a live orchestra.